Teach big ideas to your tiniest students by preparing with a toddler lesson plan designed in Canva. Any seasoned teacher of toddlers will tell you that the job comes with great responsibility. It’s at this age in a child’s life where there needs to be an increased focus on speech development, vocabulary use, large and fine motor skills, daily life skills and artistic expression. It’s for this reason that it’s important to create a toddler lesson plan that keeps you on track. Having a toddler lesson plan can help you be more productive and use time effectively. This is super helpful when you take into account how short toddlers’ attention spans can be! 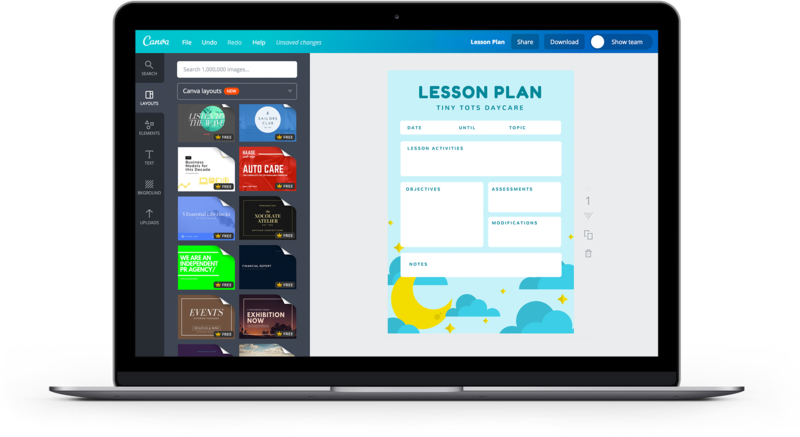 The best part of designing in Canva is that we’ve taken on the majority of the work for you by creating ready-made lesson plan templates that you can simply edit and fill in. It really is that easy. Create a new Canva account to get started with your own toddler lesson plan designs. If the thought of designing your very own custom toddler lesson plan makes you feel a bit anxious, just stop for a moment and breathe. With Canva, graphic design is effortless, empowering and easy peasy. We’ve got you covered. The best part of designing in Canva is having access to a wide variety of templates. This means that the bulk of the work has been done for you and all that’s left is to customize and edit your chosen template until it perfectly fits what you need. And even this is easy because moving, deleting or adding elements like images, illustrations, icons and text boxes is a simple matter of dragging and dropping them to where you need them to be. Perhaps the greatest challenge in teaching toddlers is ensuring that you don’t overwhelm them with new ideas and allow them enough time to absorb the lesson or activities. At the same time, you have to keep the class organized and structured because these genuinely curious little tots can quickly get distracted. Designing your lesson plan in Canva can help you to structure your time effectively by creating a pattern or template that works for you. Most of our lesson plans are already structured in tables or text groups, organized into clear steps—usually an introduction followed by activities. You can always change this up to suit your style and needs by editing the text boxes or highlighting the focal points of the lesson. Play with font styles and techniques like filling the background with an eye-catching color and write in a larger font. If you’re not sure whether your lesson plan is fitting for your toddler’s curriculum, you can always share it with your colleagues or other child care professionals to get their feedback. If you and your colleagues work as a team and utilize the same lesson plans you can even give them the ability to edit your design. Isn’t that amazing? Using Canva to collaborate is ridiculously easy. There are so many ways that you can share your design; by email, a Canva URL or through various social media platforms. With garnering feedback being this easy, you’ll have a perfect toddler lesson plan in no time. Do I need to download Canva to create my Toddler Lesson Plans? Canva is available for the web, iPhone, iPad or Android devices. There’s no need to download or install anything to use Canva in your web browser, simply create an account online to get started! You can download the Canva iPhone and iPad apps in the App Store and our Android app from Google Play for free. How can I group text or elements together? You can easily group several text boxes or elements together by holding down the Shift key before selecting all the text and elements you want to group. Click the “Group” button found on the upper right side of the toolbar. Once grouped, you can adjust, nudge or copy them. Where can I find inspiration for my toddler lesson plans? Our layout library has an amazing selection of lesson plan layouts created by professional designers. If you’re stuck for inspiration, layouts are a great place to start.